When you’re getting ready to move, there’s so much to do. Every room needs to be thoroughly cleaned, sorted and packed—and it seems like they all need it done at the same time. But some things need more attention and care than others, and glassware certainly falls into that category. Fragile and often valuable, improperly packing glass can lead to permanent marring, significant cracking and even breakage. Let’s rundown the list of packing supplies, and the steps you’ll need to take, to correctly pack and protect your glassware. Things move faster when you’re organized, and packing glass is no exception. Here’s the packaging supplies that’ll help you properly pack away your cups, vases and other glass-based objects. Bubble wrap is fantastic for protection. But if left in direct contact with glass items it can potentially leave circular pattern marks that are difficult to remove. Packing glass in packing paper or tissue paper will sidestep that problem, protecting your possessions from being marked or marred. Crumple the loose paper up at the ends—or use packing tape—to secure it. Here’s where the star of the show comes in. 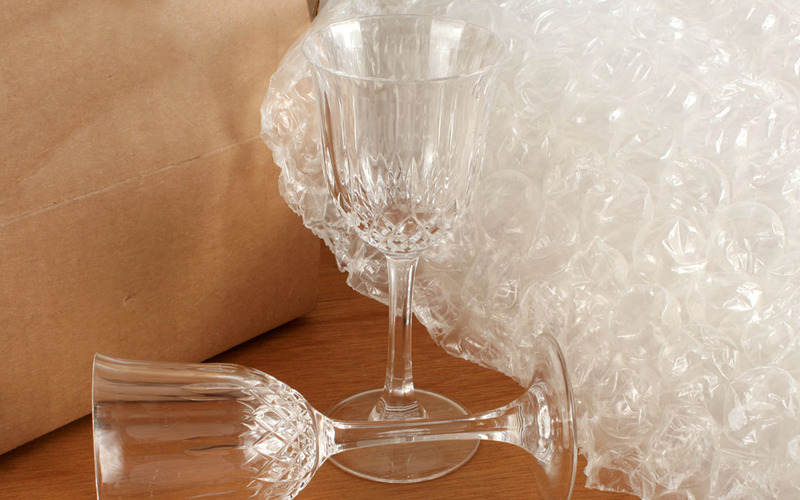 Wrap your glassware completely in bubble wrap, gathering up the loose ends, folding them over the product and securing it with packing tape. Bubble wrap sheets are the most widely available option, but if you’re looking to make packing glass a little easier, you can use bubble pouches to speed things up. Generally, if your items are much bigger or heavier than normal, you’ll want to do one of two things: use bubble wrap with larger bubble sizes, or simply wrap the item in more layers. You really can’t be too careful when it comes to packing glass, especially if what you’re packing is valuable or sentimental. Corrugated dividers are a wonderful addition to your packaging tactics here. Assembled into their crosshatch-like pattern, they’ll keep individual pieces separated and in one place, further reducing their chances of suffering damage during transit or storage. Once your glassware is wrapped up and packed into the box, you’ll want to ensure there’s no room left for anything to move or shift around. Fill in the empty spaces with leftover packing paper or bubble wrap. Use just enough to keep everything firmly in place, but not feeling squeezed or under pressure. Use carton sealing tape to close your boxes, making sure the flaps are fully taped down and unable to move. If you’re worried about dirt or moisture getting in, use the H-tape method to cover any side-flap gaps you see. Grab a marker and write “Fragile” on a few box sides. It’s no guarantee that anyone will obey the implied instructions, but it certainly helps. Moving can be chaos, and it’s easy for certain tasks to fall by the wayside. Packing glass properly is an essential—but easy to overlook—task among all the multitude of things you’ve got to handle. But with a little planning, and this list of packing supplies, we’re confident you’ve got it handled.